After 50 years, Peter Max still finds a life of art "fantastic." Preview March 11, 6 p.m.
You can tell a lot about a person from what words they use. 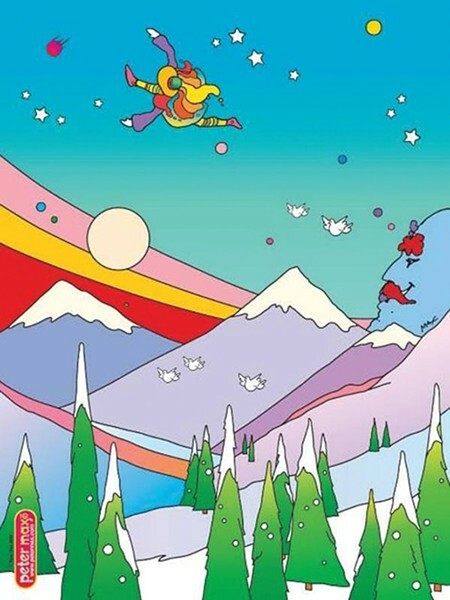 Legendary pop artist Peter Max, for instance, loves the word "fantastic." His art, in many senses, embodies every sense of that word. March 12 marks the opening of a retrospective exhibit at the Old Towne Gallery in Park City featuring Max's most popular works, spanning his career of more than half a century. The exhibit starts with a preview party March 11 at 6 p.m.
Max's style owes a lot to the Pop Art movement of the 1960s—it embodies much of the era's psychedelic flair and iconography. When he opened his studio in New York in 1962, his posters began showing up everywhere, garnering him nearly instant fame and recognition as he started appearing on television and radio and in magazines. "It was mind-boggling. Every day, everywhere it was fantastic," Max says as he remembers that time. "It was sort of the beginning of [that] media, and I explored it, and it was amazing." "Amazing" is another of Max's favorite words, and it serves as a perfect description of his unusual childhood. Born in Germany in 1937, he fled the Nazi regime with his family a year later, settling down in Shanghai for the first decade of his life. His family then moved to Israel and, after that, to various homes in Europe, before finally settling down in New York City. Though Max says he never imagined he would build a career as an artist, from his earliest days, he always loved to draw. "I never [knew] that would be something I would be doing for my life," Max tells City Weekly. "So I did that, and I was very lucky." He was encouraged by his parents and teachers throughout his childhood, while the varied landscapes he traveled through his early life influenced much of his later professional work. When living briefly in Tibet as a child, for instance, Max was entranced by the local culture, which informed much of his personal philosophy and career. "I studied a little of Buddhism, and I was interested; it always made sense to me," Max says. "I got involved in yoga, which comes from India and so forth, and as I got older, I got more and more involved in these spiritual cultures." His art also conveys his love of astronomy, a fixation on the cosmic that also served to define in part the art and culture of the '60s. The inclusion of stars, planets and other familiar astronomical icons became a defining feature of his work. "I was very, very much addicted to the knowledge of how big the universe is, and it was mind-boggling how big it is," Max says. "By now they know [the universe is] like a billion times as big as they thought, maybe billions of times as big. It's unbelievable." That last word is another favorite, one that easily describes Max's varied and colorful career. As recently as 2012, he was commissioned by the Norwegian Cruise Ship line to paint the side of the Norwegian Breakaway, done in a style evoking the culture of his adopted home, New York City. He has also done work for the World Cup, the Olympics and the Super Bowl; for U.S. Presidents Ford, Carter, Reagan, Bush, Clinton and Obama; for the Dalai Lama; and numerous other works. "If it's interesting to me, then I do it," he says. Behind the fame lies an artist who loves what he does. His signature style usually features a full spectrum of color, with deep vivid hues that speak to an optimism underlying much of his work. "I just fell in love with what was available in color," Max says. "You blend, let's say, yellow and red, and you create orange, and opposite orange is blue and it just went on and on through all these possibilities. It was fantastic for me." Given the themes that pervade his work, it's completely unsurprising to find that Max loves music, who describes himself as a fan of "all styles." The infinite combinations he sees in music mirror his own extensive work in light, color and visual composition. "I always draw and paint when music is around, whether it's radio, earphones, headsets," he says. "I get inspired. It's become very natural to me to be flowing with it." Longtime fans and newcomers to Max's work will both find much to admire in the Old Towne Gallery exhibit. When he describes the exhibit, Max says it features "a full spectrum" of his work, an oddly apt word choice. All things considered, Peter Max simply loves making art. "It's a tremendous amount of fun for me to do, and there are no boundaries," he says. "Sometimes I go left, sometimes I go right, sometimes I go through it, sometimes I'm completely reinventing myself, sometimes I'm copying myself. It just goes on and on, in every direction.